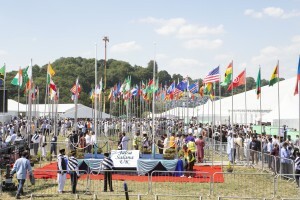 More than 30,000 Ahmadiyya Muslims from more than 100 countries are gathering on a farm near a small Hampshire village for a three-day religious festival. The event – the biggest of its kind in the UK – takes place at East Worldham near Alton. The prayers will be broadcast to more than 80 million people around the world. Kevin Ashford reports.